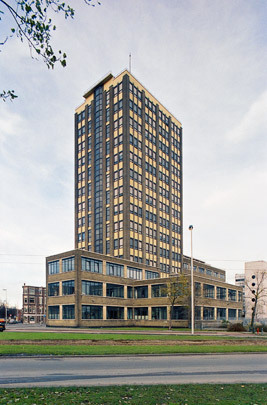 This former electricity board building with its 50 metre high tower terminates the Dijkzigt expansion scheme of 1926 in grand fashion. The high rise used to contain offices, the low-rise sections public areas and workshops. The elevations of the high rise are articulated vertically and those of the low rise horizontally, yet this severe arrangement does unify the composition. Details like the central iron circular stair, the lifts visible in the elevations and the 'cornice' reinforce the skyscraper effect. The concrete-framed building is currently being used to house students.